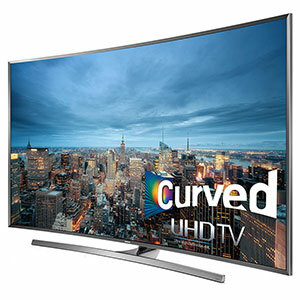 The 65-inch JU7500 is another big beautiful curved 4K UHD TV in Samsung's 2015 lineup. The displays in the JU series do not incorporate nano-crystals but their picture quality is still first-rate and will impress friends and family. Of course, all of Samsung's 4K TVs are Smart, meaning you can connect them to the Internet and stream content from a gaggle of apps like Netflix and Amazon Prime. If you are ready to step into the world of 4K TV, then the expansive Samsung 65JU7500 is a great first stride. The video performance of the Samsung 65JU7500 is excellent though it can't measure up to its nano-crystal fueled, (more expensive), SUHD cousin, the 65JS9500. With that said, the JU7500 display produces rich colors and a damn-fine image. Features on top of features, Smart TV (with more apps than you can shake a stick at) and Smart View, Wi-Fi, ,voice recognition, 3D, Bluetooth, screen mirroring, MHL and ARC support. The JU7500 does not provide an integrated video camera for Skyping and controlling the TV by hand motions. All these features are accessed through a too small remote control which can make navigation more difficult than it should be. But the initial setup of the TV is quick and uncomplicated. On the Samsung website, the 65-inch JU7500 4K TV lists for a suggested retail price of $3800, which seems a little costly even for a feature packed 65-inch 4K UHD TV. Currently, Samsung has lowered the tag to $2600, which is much more in line with the marketplace. Isn't competition grand for the consumer?